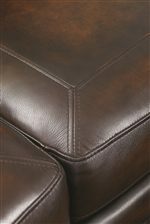 This classic leather ottoman is the perfect complement for your traditional living room or den decor. 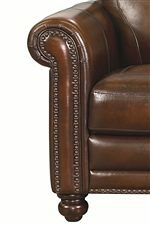 The plush top cushion features picture frame accent seaming, with antiqued brass nailhead trim around the base. Turned wood feet complete the sophisticated footrest. The Hamilton Leather Ottoman with Nail Head Trim by Bassett at AHFA in the area. Product availability may vary. Contact us for the most current availability on this product.